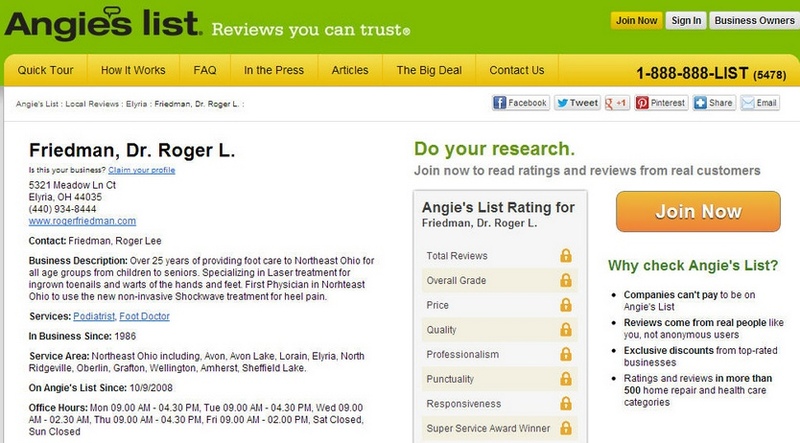 ​I rated Dr. Friedman and his staff as five stars! 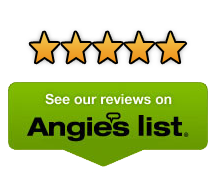 They are simply “The Best.” Went in for removal of an ingrown toenail and everyone was professional, kind and considerate. Not to mention on time! No long wait in the reception area. The only sorry part I have is that I waited so long to get this simple and quick procedure done. His team provides the best care out there! I highly recommend them! ​My wife had to have her bunion corrected. We saw Dr. Friedman on the recommendation of a friend and his office staff got her right in for an appointment. They were all so friendly and the surgery went great. Her foot feels and looks terrific! I just had shockwave therapy performed on my left foot by Dr. Roger Friedman and it was a very positive experience. I was met with patience, kindness, humor and informed every step of the way what he was going to do and how he was going to do it. He put me at ease quickly. I recommend anyone suffering with a foot problem to try him. I don't think you'll be disappointed. If all doctors were as kind and humorous, the patients of the world would be much happier! I called this morning for a problem I have been putting off for years and they had an opening in the afternoon, great I'll take it. I read reviews of several Podiatrist before deciding to call this office. After my appointment I understood why this Doctor and his team receive such high marks, they are wonderful. Dr. Friedman was polite and personable, he listened and asked questions and I felt comfortable and confident that he understood exactly what my problem and concerns were. He completed an exam of my feet, had x rays taken and reviewed them with me, he came up with his diagnosis which he explained my condition with me thoroughly and finally went over all the treatment options from most conservative through surgery. Together we came up with a course of action and I received treatment during that appointment. Great Doctor, Great Staff. I feel that Dr. Friedman listens carefully to my concerns and then explains the various options available to me in a way I can understand. His approach has always been to try and help the body to heal itself, before considering more aggressive methods of treatment. I would recommend Dr. Friedman to anyone I care about. I am very happy with the care I receive from Dr. Friedman. His staff is terrific and he is a great doctor! The staff is extremely professional and welcoming. Dr. Friedman is always prepared with my current information and definitely knows what he is doing. I just get better and better with his care! I have used Dr. Friedman as my podiatrist for over 20 years. He and his staff are the best! My son has also been treated by Dr. Friedman, and we both think he's great! I had a very sore toe and was almost ready to go the the ER (what a mistake that would have been) and my neighbor suggested I call Dr. Friedman. The woman who answered the phone was so friendly and she told me to come right over! The office staff was great and the doctor treated my ingrown toenail with a laser so I won't have to keep digging it out every month. 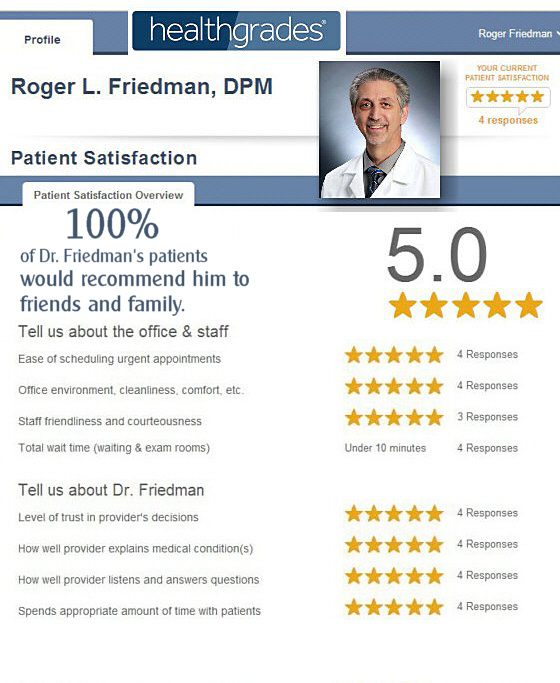 I rated Dr. Friedman and his staff as five stars! They are simply “The Best.” Went in for removal of an ingrown toenail and everyone was professional, kind and considerate. Not to mention on time! No long wait in the reception area. The only sorry part I have is that I waited so long to get this simple and quick procedure done. His team provides the best care out there! I highly recommend them. Dr. Friedman is one of the best doctors. My surgical process was painless during and after the procedure. Would recommend him to friends and family. Excellent office staff. The doctor was very friendly and professional. He explained things very well to me and didn't seem rushed.